I was pondering this last night. What if the Voth decide to leave their claim of territory in the Delta Quadrant and travel all the way back to the Alpha Quadrant to reclaim their planet of origin, Earth? Would the Federation survive if the Voth were succesful in this? Their city ships are colossal in comparison to Starfleet ships and the Voth transporters are so powerful that they are basically weapons and could tear ships apart just by transporting one away. Individual ships don't stand a chance, I suppose and I personally doubt a fleet or a group of Federation ships would put a dent in them in any way. That, and a 65 million years technology gap, in theory. Though I suspect they have forgotten more than they learned. Aside from that, what would Voth and Federation Law have to say about this case? Voyager proved it to some degree. As for the motivation thereto, why the Voth would want to reclaim Earth, I do not want to pay attention, I didn't think that through yet. It still bugs me, though. Personally, I find it difficult to consider without being drawn back to the question of "why," and I can't think of one satisfactory answer. I almost think the Why question is a separate discussion altogether, I imagine this just taking place when all discussion around that subject on the Voth side has been concluded and that all Voth of the claimant force are convinced they have a rightful claim on the Earth once again. I could fill in my own theory, but it remains shaky, as I thought it up just this night and is mostly my own imagination without really any sort of underlying reason. Currently I'm just looking at the feasability of one such a Voth city ship emerging somewhere near Earth orbit claiming Earth as their place of origin and intending to recolonise it. One ship wouldn't stand a chance naturally. I mean, look at what happened to Voyager. Although we have no clear insights in the limits of Voth weapon strength and technology, I wonder wether larger numbers of Starfleet ships could stop them. shran wrote: I wonder wether larger numbers of Starfleet ships could stop them. I doubt it. While their transporter technology is impressive, it's their effectors that are the real weapon - they completely shut Voyager down, right down to the hand phasers. Against that sort of capability, I suspect every species up to and including the Borg exist because the Voth have no interest in them. A war would be about as short and one-sided as it gets. So, reclaiming it would be very easy. Then I wonder, could they hold it and for how long? They would exterminate us to the point that no primate of anykind lived anywhere in the Milky Way. shran wrote: So, reclaiming it would be very easy. Then I wonder, could they hold it and for how long? Permanently. Again, if they can shut down every bit of technology you have then you have no hope. If you get really annoying then the Voth just start beaming every human life sign on the planet 200 miles straight up. 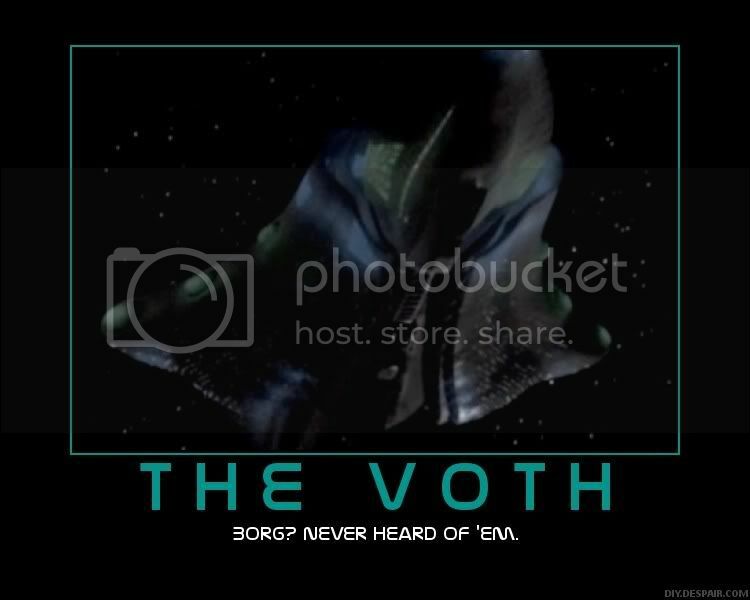 I think the only ones who could do anything about the Voth are the Q.
I was going to add the Organians to stitch's comment, but if the Voth shut down Voyager through cutting off its energy source (I'm assuming), can they outright kill the Organians? Just shut them off? Problem I see is that we really do not know the extent of their technology. It could be so great that the Borg are insects to them. Or that they do have limitations such as their energy nullifier of doom works on one ship at a time. So a fleet could harass the hell out of them. But really, they should have some form of advanced shields and maybe even exotic weapons. 65 million years of slow technological development will trump anything the Federation could throw at them. The only weakness they seem is their total lack of adaptability. They ignore evidence they don't like and live the same way for millions of years. If the Federation or anyone could find one little weakness they could probably exploit it rather well and the Voth would take a long time to fix it. I do wonder how big their fleet is. Is it the one ship or is it numbering in the hundreds or thousands? Do they have dedicated warships? I got the impression there were a few ships but not a massive number. A very settled slow society. I wouldn't be surprised if they had population control.